Found throughout the forest in grassland and in scrub. Active day and night, a voracious feeder. Feeds mainly on earthworms, beetles. Note the pointed head. 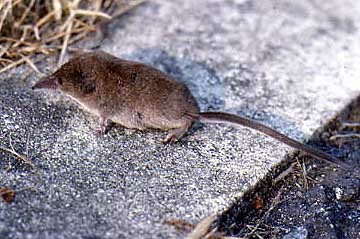 Found throughout the forest, but commoner in the long grassland areas compared to the Common shrew. 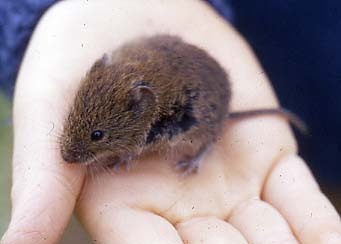 Food similar to common shrew but smaller prey items. Found in the forest near housing, using brambles for cover. 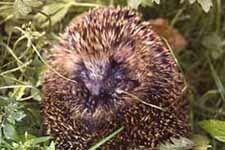 Mainly nocturnal and feeding on earthworms, beetles, slugs and caterpillars. 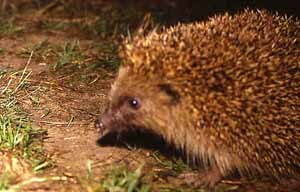 When disturbed by dogs, foxes or badgers, the hedgehog will roll into a ball protecting vulnerable parts with its spines. 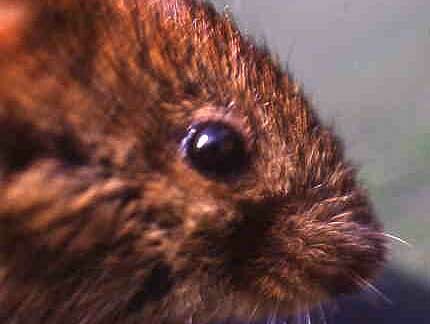 BANK VOLE Clethrionomys glareolus. Not so common in the forest compared to the Field vole below. Mainly associated with woodland and scrub edges. FIELD VOLE Microtus agrestis Common in the grassland areas. 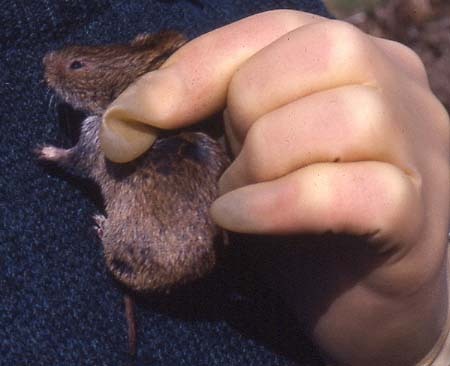 Field vole showing its short tail compared to the Bank vole. HOUSE MOUSE Mus musculus. Found around the farm and buildings. Eyes smaller than the Woodmouse. WOOD MOUSE Apodemus sylvaticus. Common in the woodland and scrub areas of the forest where there is good ground cover. 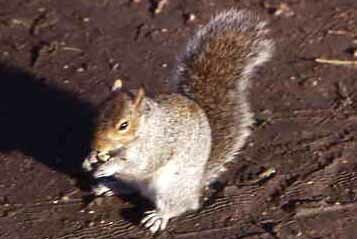 Mixed diet of seeds and invertebrates. YELLOW NECKED MOUSE Apodemus flavicollis. 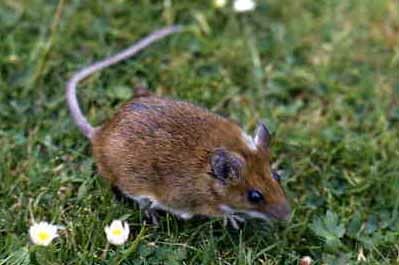 The Yellow necked mouse is slightly larger and heavier than the Woodmouse. 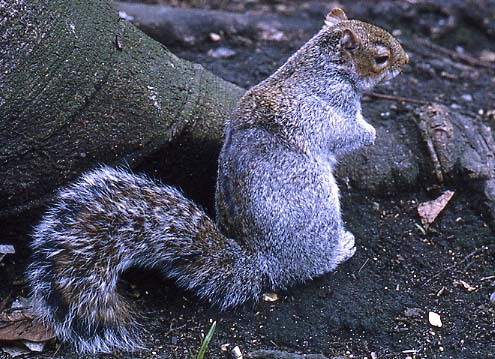 It often climbs trees and is more vocal. 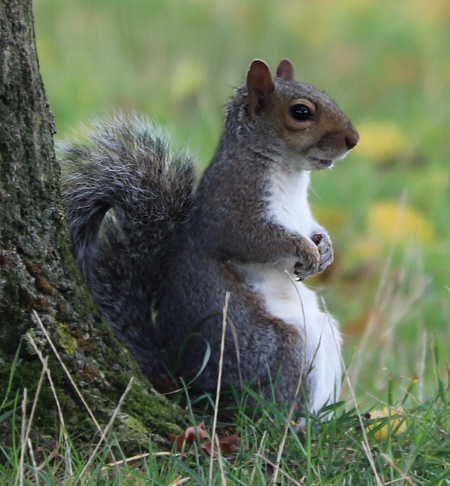 There is a good breeding colony in Hainault Lodge Nature Reserve and almost certainly in the forest, although live trapping has not been carried out there. Right: Photographed in a nest box on the Hainault Lodge Nature Reserve in Dec 2006. 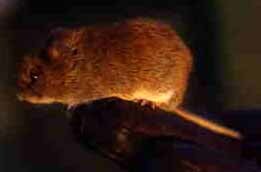 It can be distinguished from the Woodmouse by a yellow-brown band on the underside of the neck. COMMON RAT Rattus norvegicus. Found around the farm and commonly in the forest especially around the lake and ponds where excessive amounts of bread are left for the wildfowl. Young Common rat. 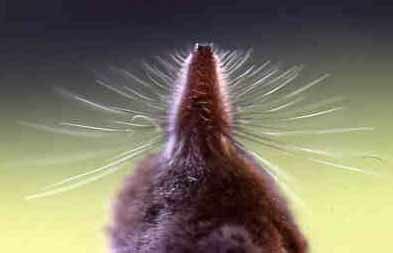 The thick base of tail distinguish it from a mouse. 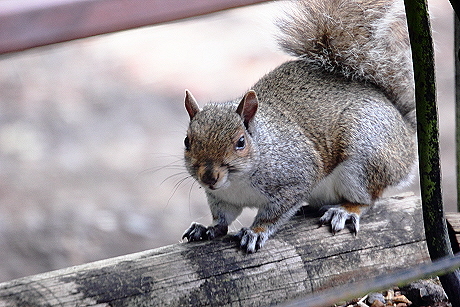 GREY SQUIRREL Sciurus carolinensis. Common in all parts of the forest. Sharing. 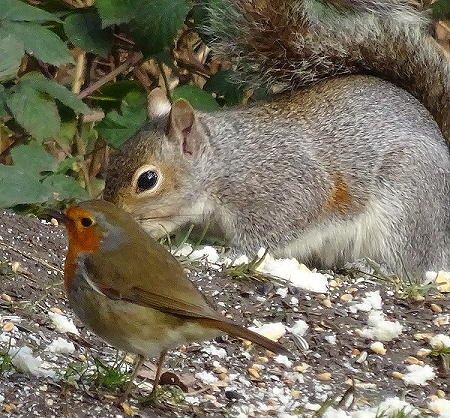 Robin and Grey squirrel at Sheepwater. 7th March 2017. RABBIT Oryctolagus cuniculus. Common throughout the forest, feeding in rides and scrub areas. It will feed in the grassland areas at dusk and dawn. 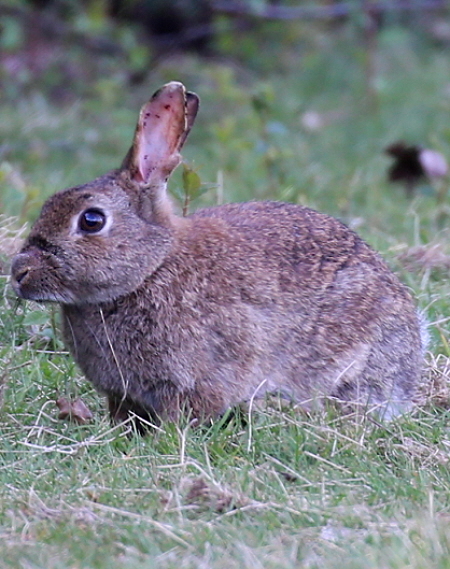 The swollen eyes and its approachability shows the rabbit suffering from myxomatosis. Photo: 1st July 2006 in the plantation. Rabbits come out through the blackberry bushes to feed on the grass. Photo © Colin Carron. 18th February 2016. A Rabbit appears to have been in a fight. Photo © Colin Carron 11th May 2017. 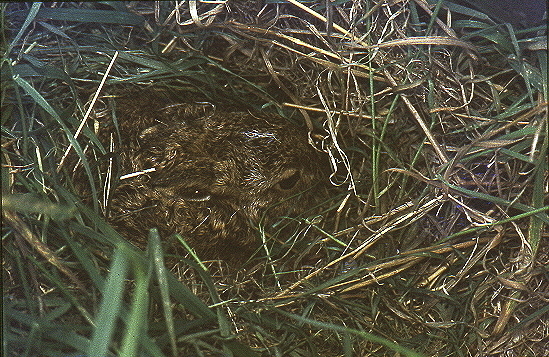 Leverets in their form 1985. Photo © Vic George. 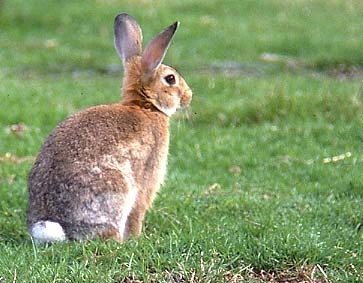 Hares used to be seen in Latchford meadow. 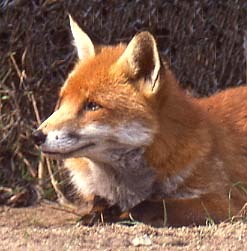 FOX Vulpes vulpes. 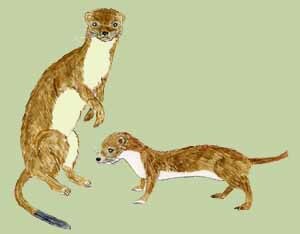 It is nocturnal but often seen in the forest and Hainault Lodge Nature Reserve during the day..
STOAT Mustela erminea and WEASEL Mustela nivalis are both glimpsed in the forest. 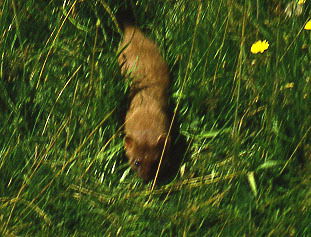 The stoat feeds on birds and rabbits and is seen in woodland and scrub areas. It has a black tip to the tail. The Weasel is often seen on the farm where it feeds on small mammals. Drawing: Brian Ecott. Stoat photographed in the rough grassland area by Vic George. 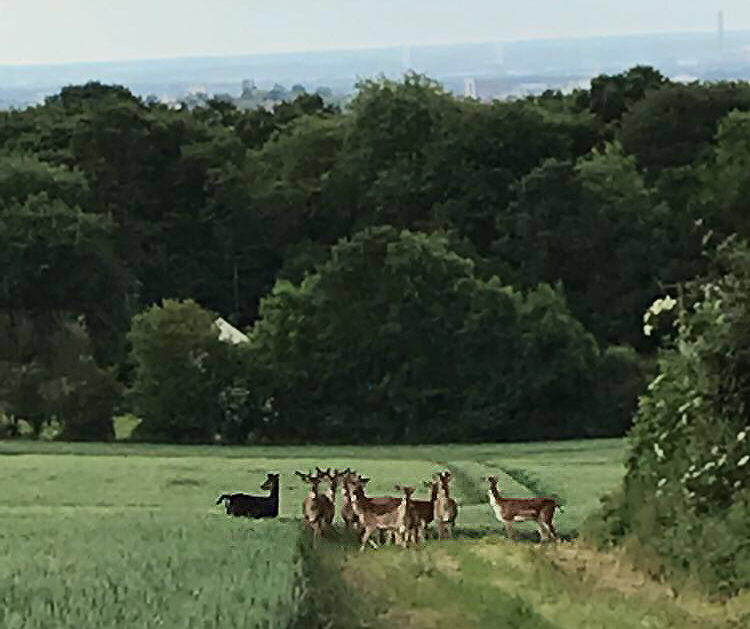 Louise Waters kindly sent me this photograph of a small herd of Fallow deer seen recently from her cottage in Lambourne End on the edge of the Forest. Two bucks with antlers are present. On the left is a dark form normally associated with the Epping Forest herd..
FALLOW DEER Dama dama. Buck photographed at Weald Park. 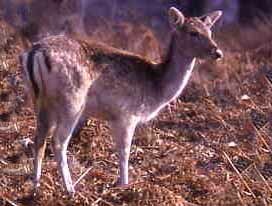 The Fallow seen in Lambourne forest and the surrounding fields are generally darker and lack the spots. Small Fallow deer herd on 13th February 2007 seen on the Havering land. Fallow doe. The male is a buck and the female a doe. 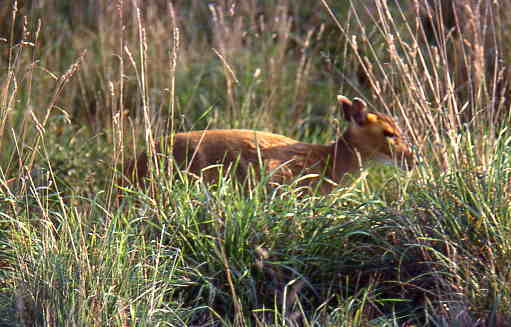 MUNTJAC Muntiacus reevesi. Present in the forest but generally unseen. Can be mistaken for a dog running through the undergrowth. 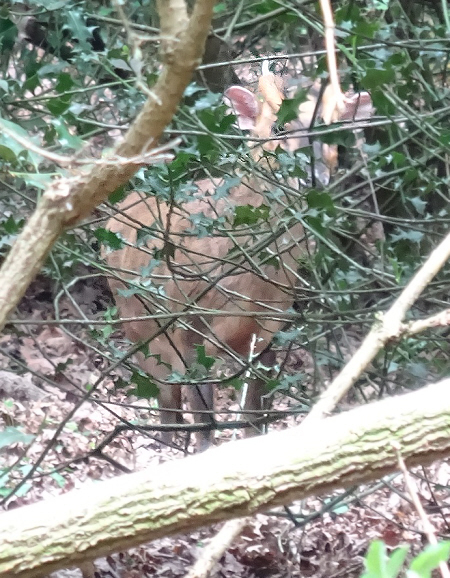 Raymond Small tracked down a continual barking sound in Hainault Lodge on 5th May 2017 which turned out to be a Muntjac aka Barking deer. He found it hiding in a holly bush. Photo © Raymond Small.